DURING my two-year stay in Cebu, particularly in San Isidro, Talisay City (formerly Talisay town) in the early '70s, I have not gone and seen the tourist destinations of the province. I only saw some of them recently following the wedding ceremony of my nephew in a Christian church in Cebu City. Cebu province is known historically as the bastion of the Roman Catholic faith in Asia, as this is the place where the first cross of the late Spanish explorer Ferdinand Magellan had been planted when he and his companions discovered the Philippines on March 16, 1521 while on an expedition authorized by the king of Spain. Named as "Magellan's Cross" and one of the top ten tourist spots in Cebu, the site is often visited by the local, national and foreign tourists when they are in Cebu City. Little did I know that aside from it, Fort San Pedro, and Taoist Temple, there are several other beautiful sceneries in Cebu like the Sumilon Island, Kawasan Falls, whale or "Butanding" watching in Oslob, Bantayan Island, Osmeña Peak, and Papa Kits Marina and Fishing Lagoon, among others. These spots have been visited by foreign tourists, than the locals, as they have the money to pay for the fees like entrance, lodging and food, and other miscellaneous expenses. 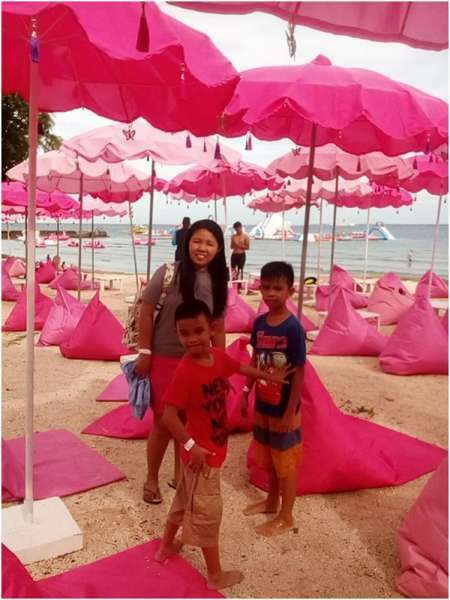 True enough, in our desire to see the beautiful spots in Cebu, we, the family clan of Junco, first ventured to the Happy Beach Resort in Mactan, Cebu. It was an adventure we could not forget, as we enjoyed swimming at sea using an "inflatable" device. My wife, daughter and I tried the modern way of balancing through the inflatable foams, to see whether we could climb and hurdle without falling into the sea. The three of us failed to pass the challenge several times, as we fell into the sea. While the rest of our relatives just sat at the seashore under the pink big hat to cover them from the scorching heat of the sun, others enjoyed swimming at the pool. As we left the place, we could still remember the big waves that shudder our lifesaver before we transferred to the pump boat. Big waves also battered the pump boat, but we were not afraid as we were just near the shore. The following day, my elder brother and his family from Tuguegarao City went to Bohol to see the tourist destinations there. 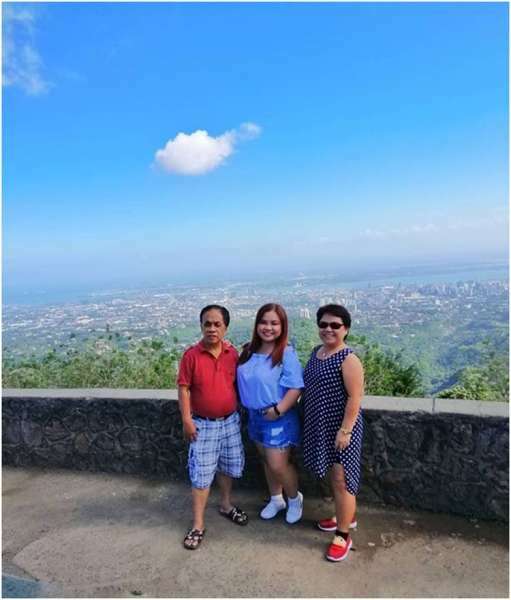 My wife, daughter and I opted to visit one of the beautiful spots in Cebu, as we had been visiting Bohol several times in the past. We went to Tops in Barangay Busay, where we saw the entire Cebu City and its nearby places. It is much beautiful to stay there at night. The place has a skyline garden where tourists could walk around to view the frenzied Cebu City's tallest buildings and houses. At the right side was an open concrete shelter where the tourists or visitors also could loiter and pose for a picture, and comfort room on the left, along with mini stores selling souvenirs and food. Sad to say, I also saw several bottles of beverages left on the pavement, which could be an eyesore to tourists or visitors like us. We left the place and went to Sirao Garden and Terrazas de Flores Botanical Garden, which are located not far away from Tops. There, we saw various kinds of flowers. There were also amenities to attract tourists. It was my first time to see such kind of flower gardens filled with various colors and beautiful flowers. Seeing the beauty of nature was a breathtaking experience for us as a family. The next day, we toured at Robinsons Mall in the heart of Cebu City to meet my longtime friend and co-student from Cebu Bible Seminary in Talisay City. There, in one of the fast-food restaurants, we ate our hearty lunch before we parted ways. At night, we, along with my sister from USA, proceeded to Cordova, Cebu to see the 10,000 roses. Also, we posed for a picture while sitting in a bench with the 10,000 roses as background. Afterwards, we took our dinner on a sea-floating restaurant with gusto. We went to our lodging place owned by my cousin in Cebu City proper filled with laughter and joy for experiencing the beauty of nature and delicacies of Cebu.